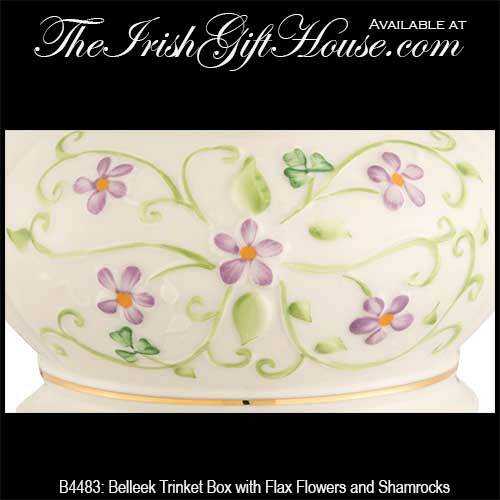 Irish jewelry boxes are offered in an assortment of over 40 different designs! 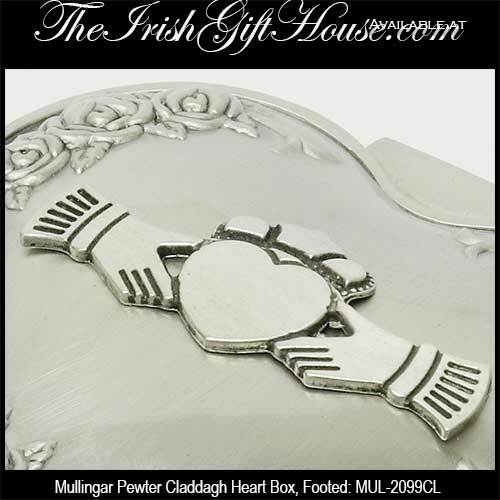 Select a musical Irish jewelry box or maybe a Claddagh box in pewter. 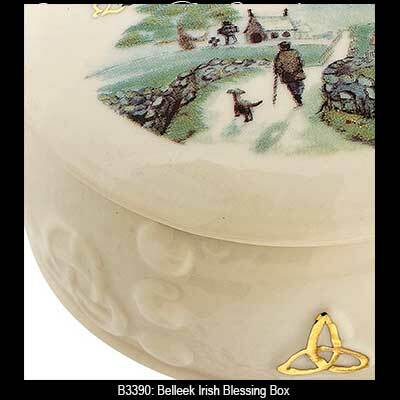 These Irish boxes are ideal for jewelry along with trinkets and special keepsake treasures. 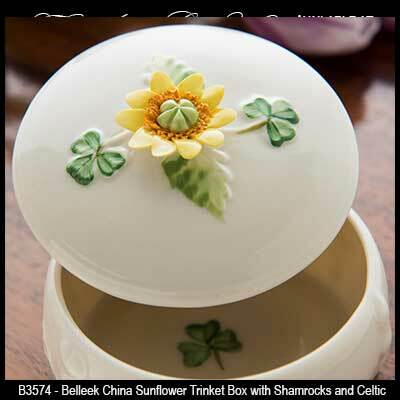 The Irish Gift House offers our jewelry boxes a litany of icons that include Irish blessings along with shamrocks or Celtic knot-work. 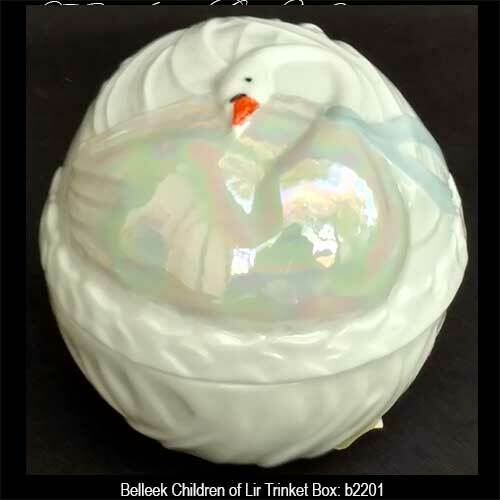 You may select from Irish boxes from Belleek China along with Mullingar Pewter and Galway Crystal or even several that are crafted from wood. 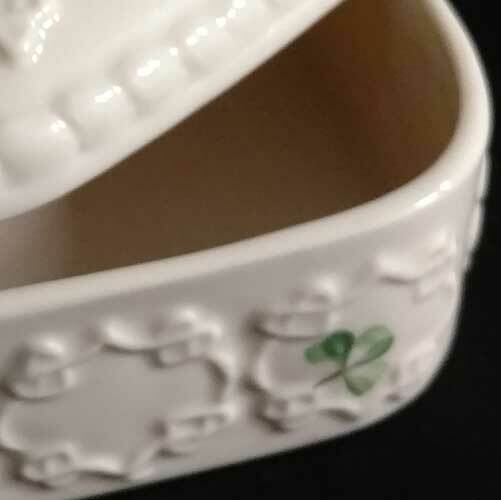 Naturally our assortment would not be complete without Claddagh boxes or musical Irish jewelry boxes, so we made sure that we have several of these styles to offer. 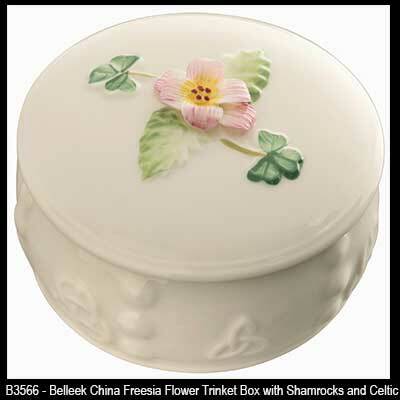 Tara jewelry box from Belleek is an Irish china design that features Celtic knots and shamrocks. 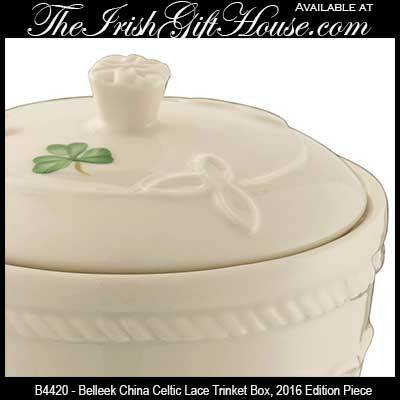 Belleek china trinket box is a heart shaped china design that features a shamrock and floral design on the lid. 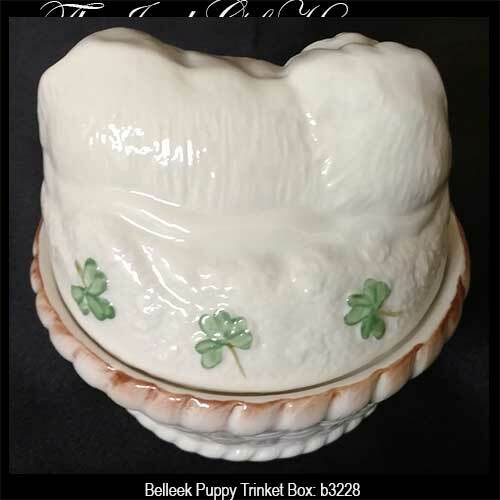 Belleek box is an Irish china design that features a sleeping puppy in a basket that is enhanced with hand painted shamrocks. 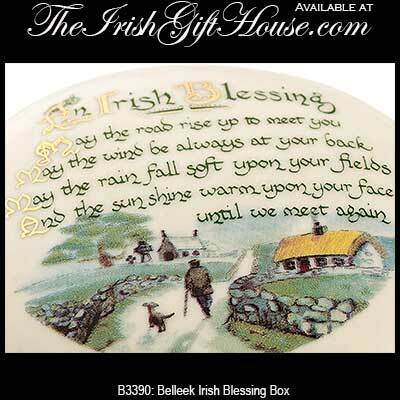 This Irish trinket box features pewter that is enhanced with an embossed shamrock. 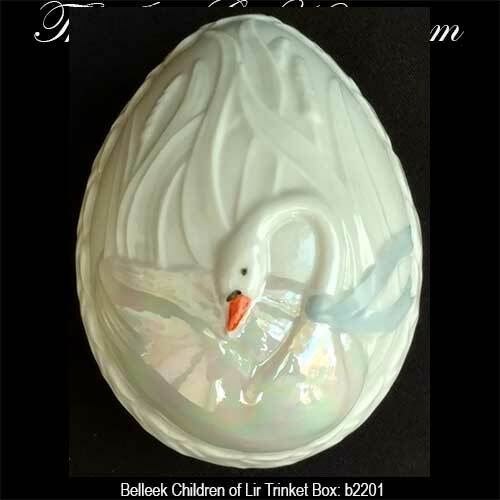 Belleek box features fine Irish china that is enhanced with a Children of Lir swan. 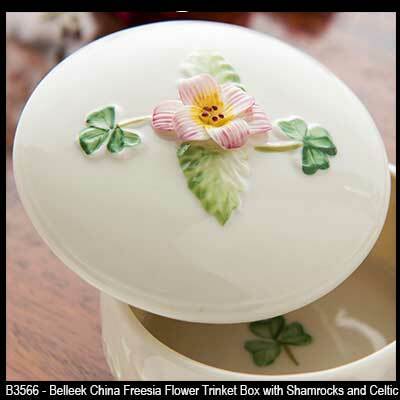 Belleek jewelry box features fine Irish china that is enhanced with the embossed Kylemore motif along with hand painted shamrocks. 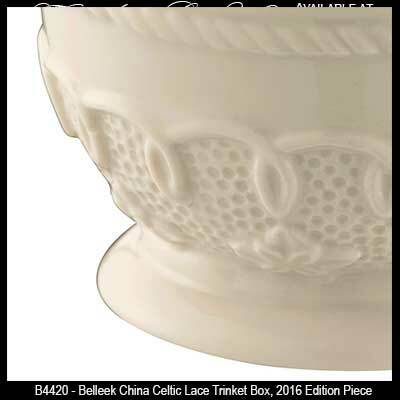 Belleek box is crafted of fine china that features and Irish wedding blessing along with a hand painted shamrock on the inside. 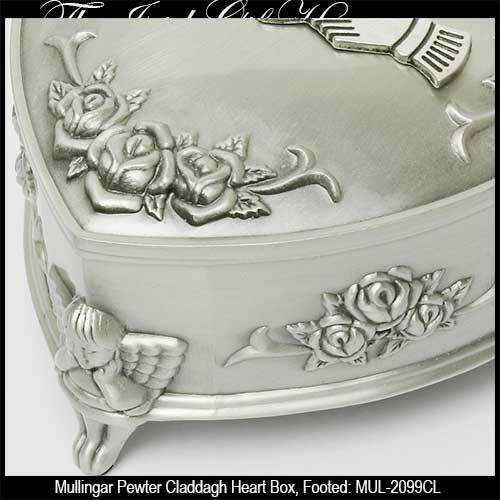 This pewter trinket box features a heart shape that is enhanced with the Irish Claddagh symbol along with cherub feet and roses. 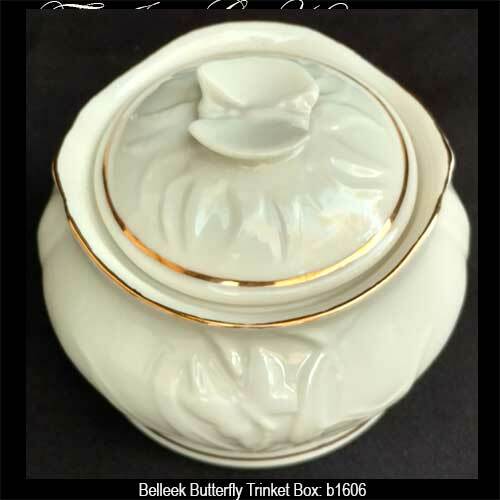 Belleek box features fine Irish china that is enhanced with butterflies. This Irish crystal jewelry box features a heart shape design. 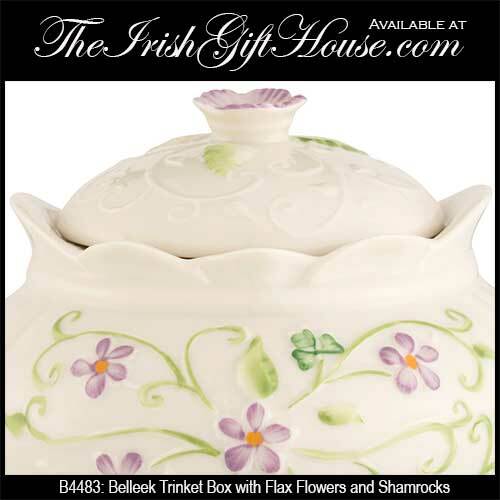 Belleek box features fine Irish china that is enhanced with a freesia flower on the lid. 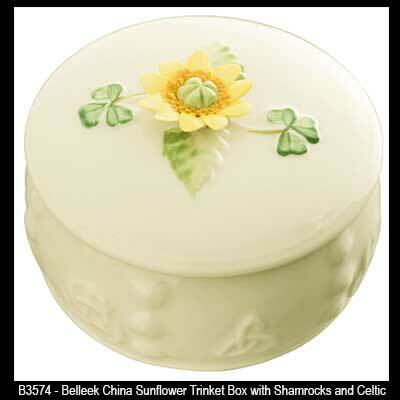 Belleek box features fine Irish china that is enhanced with a sunflower on the lid. 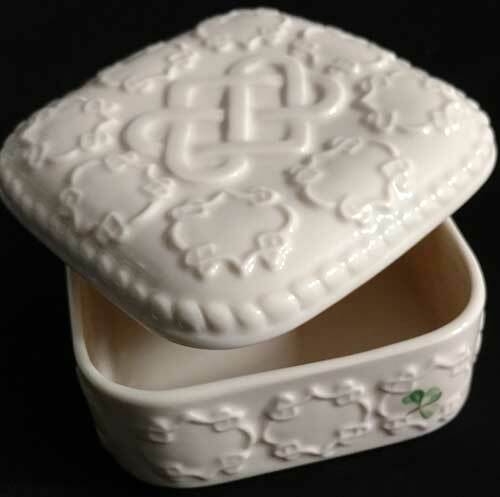 Belleek China box is features an intertwined Celtic love knot along with an interlaced heart motif and a shamrock. 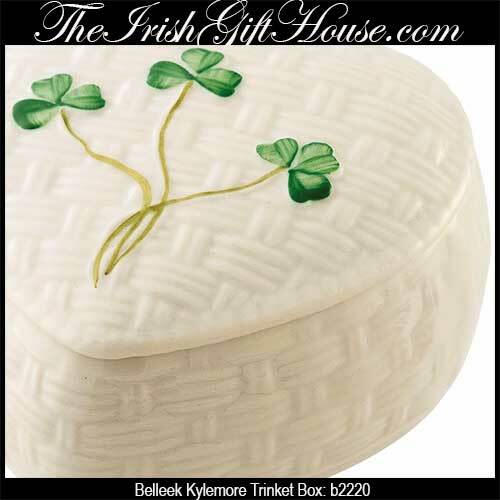 This Irish jewelry box features shamrocks that are carved on the wooden lid. 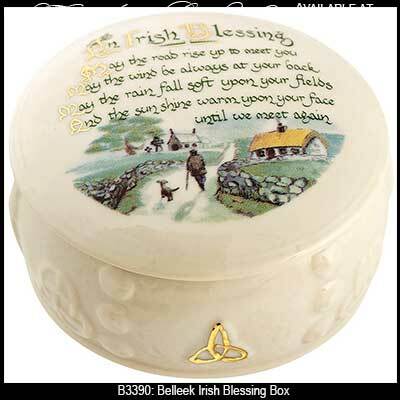 This Irish blessing jewelry box features wooden construction with a pewter inlay on the lid. 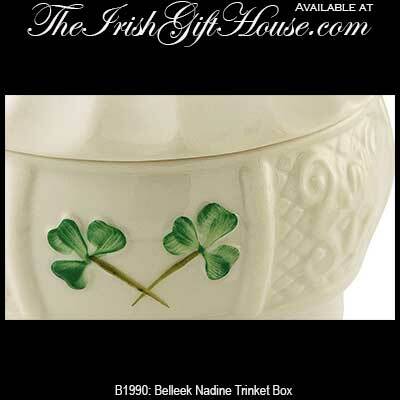 Several of our Irish boxes are heart shaped and could be used as a unique gift box for a piece of jewelry! For that reason you may wish to take a look at our vast selection of silver Claddagh rings or for a bit of extravagance, a diamond Claddagh ring. Additional considerations for a bobble to put inside one of our many Irish jewelry boxes are the silver Celtic necklaces or perhaps a pair of gold shamrock earrings would be more to your liking. Either way you win, because The Irish Gift House has many options of both styles. For more true Irish gift ideas you may wish to browse the History of Ireland jewelry collection that is made exclusively in Ireland by Solvar or select a Connemara marble necklaces; the green marble is quarried only in the west of Ireland.